1/4" - Obedience, agility and field trainers from coast to coast recommend this lead. The 6' length is ideal for formal training. Also available in 2', 3', 4' and 5' lengths for those who prefer a shorter lead for training. 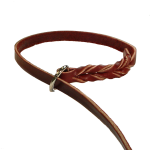 Hand cut leather and hand-braided, these soft latigo leather leads are just right for all your training needs. Nickel plated snap. 3/8" - Obedience, agility and field trainers from coast to coast recommend this lead. The 6' length is ideal for formal training. Also available in 2', 3', 4' and 5' lengths for those who prefer a shorter lead for training. Hand cut leather and hand-braided, these soft latigo leather leads are just right for all your training needs. Brass or Nickel plated snap. 1/2" - Obedience, agility and field trainers from coast to coast recommend this lead. The 6' length is ideal for formal training. Also available in 2', 3', 4' and 5' lengths for those who prefer a shorter lead for training. Hand cut leather and hand-braided, these soft latigo leather leads are just right for all your training needs. Brass or Nickel plated snap. 5/8" - Obedience, agility and field trainers from coast to coast recommend this lead. The 6' length is ideal for formal training. Also available in 2', 3', 4' and 5' lengths for those who prefer a shorter lead for training. 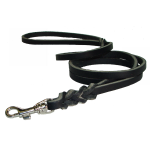 Hand cut leather and hand-braided, these soft latigo leather leads are just right for all your training needs. Brass or Nickel plated snap. 3/4" - Obedience, agility and field trainers from coast to coast recommend this lead. The 6' length is ideal for formal training. Also available in 2', 3', 4' and 5' lengths for those who prefer a shorter lead for training. Hand cut leather and hand-braided, these soft latigo leather leads are just right for all your training needs. Brass or Nickel plated snap. 1" - Obedience, agility and field trainers from coast to coast recommend this lead. The 6' length is ideal for formal training. Also available in 2', 3', 4' and 5' lengths for those who prefer a shorter lead for training. Hand cut leather and hand-braided, these soft latigo leather leads are just right for all your training needs. Brass or Nickel plated snap. Hand braided latigo leather makes this Figure 8 a winner for daily use. It's a slip lead with a "D" ring braided behind the "O" ring and a snap braided into the handle. Just clip the snap onto the front "O" or "D" ring in the slip mode and shorten the lead by half. Use the slip end as a handle and attach the snap to your dog's collar. This is a handy and useful multipurpose lead. Available in 3/8", 1/2", 5/8", 3/4" and 1" widths in a 6 foot length in burgundy or black latigo leather. Obedience, agility and field trainers from coast to coast recommend this lead. The 4' or 6' length is ideal for most training situations. Hand cut leather and hand-braided, these soft latigo leather leads are just right for all your training needs. Nickle plated ring.